Luna is a lovely gray tabby girl, born 1/14/17. Sweet Luna was found in a yard in Plainview, all alone and crying in the rain. To make her situation even sadder, she had an injury to her tail that required a partial amputation. 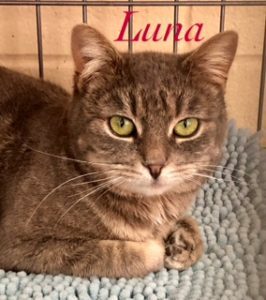 Luna is now healed, healthy, and seeking her special person. She’s accepting visitors now. Once you meet Luna you will want to take her home! This entry was posted in Adopted, Adult, Cats, Female, Wantagh Adoption Center. Bookmark the permalink.